Continuous sprinkler maintenance and repairs help prevent and correct common problems before they turn into costly fixes. Small issues can quickly evolve into expensive problems. Allen Outdoor Solutions offers a wide array of cost-effective maintenance plans for every budget. From a small front lawn to a large athletic field, we have a sprinkler maintenance plan that will ensure your system keeps your grass and landscaping green year after year. Our licensed service technicians’ goal is to make sure your investment in a sprinkler system is protected through proper care, maintenance, and repair. With over 100 A+ ratings on Angie’s List and the BBB, you can be confident in the quality of our work and customer service. At the beginning of each season, we’ll turn on your water supply, pressurize your system, and check for any leaks or adjustments. We’ll also ensure that your backflow preventer, rain sensor, and controller are all properly set and in working order. We’ll make sure that your system is in optimally functioning condition to ensure a healthy lawn. Throughout the season, we’ll check in to update water times as the season changes—and ensure your system is keeping your lawn green and healthy. 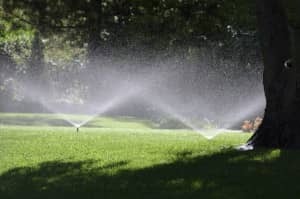 At the end of the season, we’ll stop by to winterize your sprinkler system to ensure the water has been removed, so the system is ready for the next season. By taking the proper end-of-season precautions, you are protecting it against winter damage and making sure it’s ready for next season. Annual testing of your backflow device is a requirement of both the Missouri Department of Natural Resources and the St. Louis County Ordinance. We will ensure that a licensed technician tests the backflow device and makes repairs if needed. We’ll send in the proper paperwork to the water purveyor so you don’t have to worry about it. Protect your investment by signing up for one of our sprinkler maintenance plans. With more than 100 A+ reviews on Angie’s List and the BBB, we’ve proven that client satisfaction is our top priority.